The Pittsburgh Botanic Garden is not just a wedding venue though, they have a unique mission of conservation, education, and community engagement, making them a perfect venue for any eco-conscious couple. “We’re nurturing a unique vision at the Pittsburgh Botanic Garden. Today you can wander our 60-acre Woodlands and enjoy an award-winning Lotus Pond. The stunning Margaret Lawrence Simon Dogwood Meadow. Fun exploration stations for families. And three miles of peaceful, wooded trails. You can see the roots of our region in an historic homestead featuring a log cabin, heritage apple orchard and chickens. And you can celebrate special occasions in our beautifully restored 1870s barn that also serves as our Bayer Welcome Center. For more information about the Pittsburgh Botanic Garden visit their website http://pittsburghbotanicgarden.org/. For couples who have their wedding ceremony and reception at the Pittsburgh Botanic Garden, the space is set to flow all as one. As guests follow the path to the ceremony area, they are greeted by a beautiful and private space. The ceremony guests sit facing the set of doors in the rustic stone wall and the paved pathway creates an isle for the bridal party. Naturally, a hot July day called for bright flowers to match. 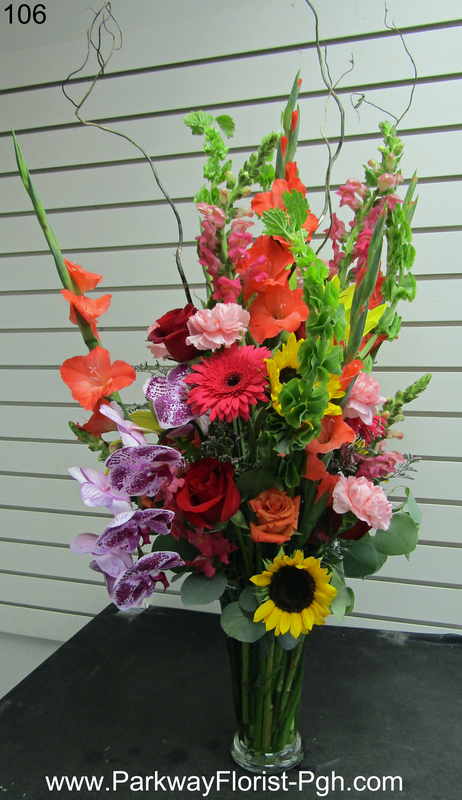 With the temperatures nearing 90 degrees, we delivered on our promise to bring bright & happy flowers. 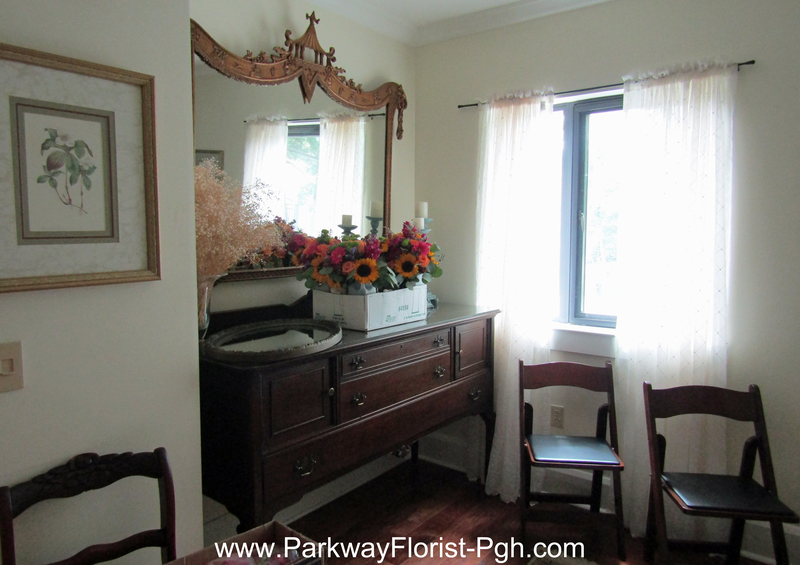 Jessica carried a bouquet of sunflowers, gerber daisies, roses, stock, green button pomp, and blue thistle. This gave her the bright colors she craved. Her bridesmaids carried equally fun bouquets made up of coordinating flowers. The same bright look was achieved, perfect for Jessica & Chris’s hot wedding day. 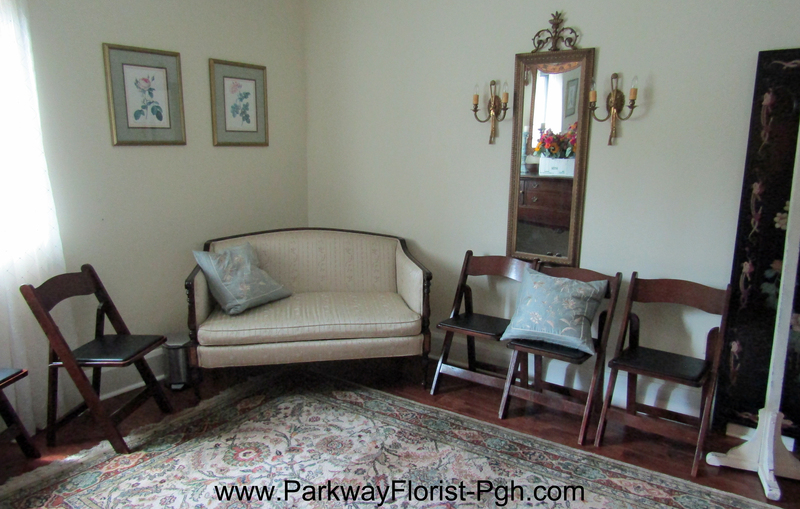 At least there was some relief from the heat, the Pittsburgh Botanic Garden provides a lovely air conditioned bridal suite perfect for those nervous moments before the ceremony. The vintage feel is comforting and calming. Once Jessica & Chris’s ceremony concluded, the guests simply turned around and entered the reception area under the white tent and into the rustic barn. 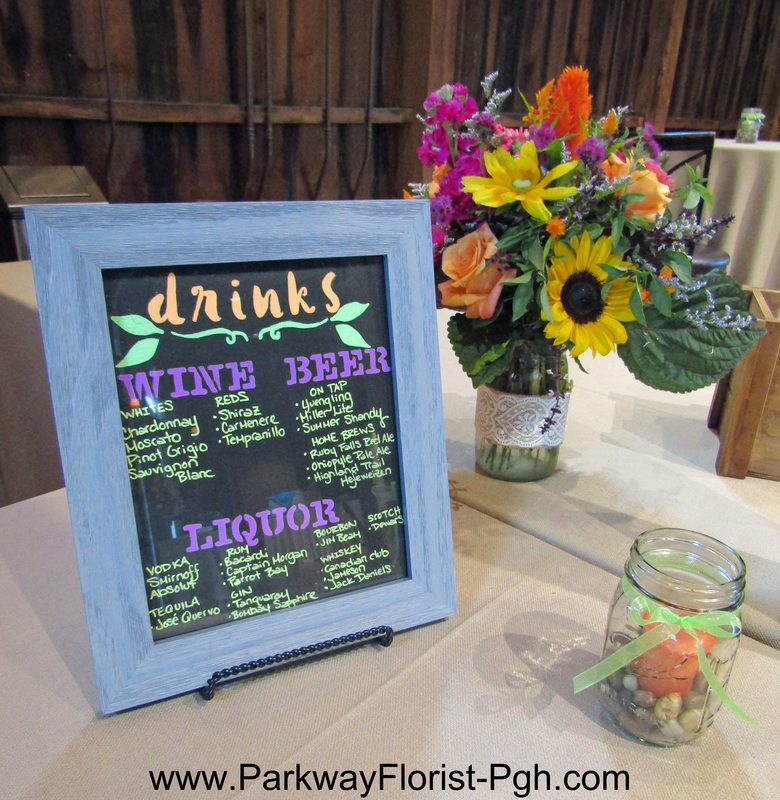 The long guest tables were decorated with mason jar centerpieces filled with more of our bright, happy flowers. The favor was a small potted plant, perfectly appropriate for this garden venue. Our bride Jessica, chose a romantic sweetheart table which was set closest to the building. After the ceremony, the bridal party flowers would decorate this table for a bright and festive look. A visit to the Pittsburgh Botanic Garden is never complete without admiring the huge stone fireplace. Decorated with photos and candles, Jessica & Chris made it feel just like home. What’s a wedding reception without a toast to the new Mr & Mrs? Extra centerpieces were used inside the barn to decorate Jessica & Chris’s bar, cupcake table, and a large arrangement that was used as a memorial vase. We are so happy that we could be a part of this couple’s big day. We wish you a long happy marriage. And for us, seeing all of the beautiful venues Pittsburgh (and beyond) has to offer is a treat in itself. Our passion for weddings only grows stronger as we face each new challenge or obstacle. We hope that you enjoy our weekly pictures and story, and return to see what our next adventure holds! This entry was posted on July 25, 2017, in Weddings - 2017 and tagged Bright Flowers, Colorful Flowers, Eco-Concious Wedding Flowers, July Wedding, July Wedding Flowers, Locally Grown Wedding Flowers, parkway florist wedding, Pittsburgh Botanic Garden, Pittsburgh Botanic Garden Wedding, Pittsburgh Botanic Garden Wedding Flowers, pittsburgh wedding flowers, pittsburgh weddings, Roses, Shop Local Buy Local, sunflowers. Bookmark the permalink.